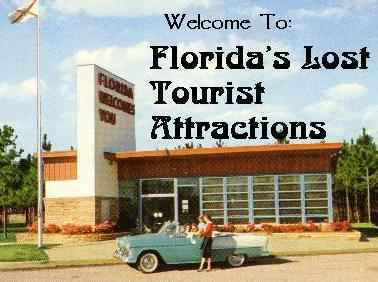 Once upon a time, before the giant mouse ate Orlando and Interstate Highways were built to cattle chute the tourists directly into International Drive, there was another Florida. It was somewhen between Henry Ford's mass production of the Model-T, which made automobile touring a commonplace, and Walt Disney's mass production of the tourist experience, which made the road trip a mere way to get there, instead of the there itself. It was the age of the roadside attraction. Tourist attractions have a way of springing up on the Florida roadside like wildflowers -- or litter: bright, shiny and full of hope to begin with, only to wither and die when they just can't quite sustain the magic. You will find no historical marker to mark their passing, no footnote in the history book, only the occasional exotic plant, or shopping center, or oddly named road. Memory soon dims and they are forgotten, lingering only as a trace of a reminiscence. Until now. I'm creating this site as an homage to the diversity that was Florida tourism, and, as my research fills things in, I'll be delving into the details of those forgotten places and updating this page with a record of this largely uncharted chunk of the state's history. If you don't see it above, try The Master List of Forgotten Attractions or Why don't you list... on attractions that are still open. Never Never Lands: proposed parks that were never opened. Looking for information on currently operating theme parks? See Theme Park City. At the moment, due to a spammer spoofing my email, webmaster@lostparks.com has been shut down. I'll probably post a new email shortly. Before emailing me check the Why don't you list... page first, and understand that I do not have the time to research questions and provide any information on these attractions other than what is already here. If I had the time or the information it would generally be on the site already (additional profiles are always in the works, but you'll just have to wait for them to be completed and posted). This site generates a surprisingly large volume of email and, while I appreciate your well wishes and reminiscences, I do not always have the time to reply. Note that none of the attractions profiled here still exist, so asking about hours or prices doesn't make a whole lot of sense now, does it? Want to learn how to produce murder mystery shows? Visit ImprovActing.com. This site Copyright (c) 1997-2015 by Robert H. Brown, all rights reserved.